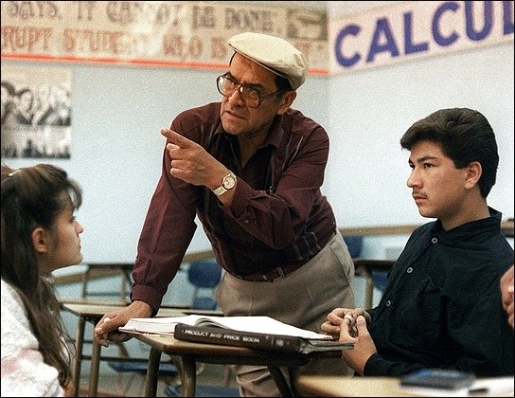 Jaime Escalante, the most famous math teacher in the world, passed away last night at his son’s home in Roseville, California. He had been receiving treatments for bladder cancer. While you might not know who Escalante is, you’ve probably seen the movie based on his life, 1988’s Stand and Deliver starring Edward James Olmos as Escalante. He was, without a doubt, the best math teacher in the world, because he demanded success and accepted nothing less than hard work from his students. Jaime rose to fame as quite possibly the best math teacher in America when 14 students from dirt-poor East LA’s Garfield High School took, and passed, the Advanced Program calculus test. Of course, since that many poor minorities couldn’t take and pass the AP test, they had to be cheating, so the state forced the students to retake the test. When 12 of them passed the second time, it was obvious that there was just something about Escalante. Rather than teach down to his students, he brought them up to the level of their peers, showing that kids can rise to meet standards when properly prepared and motivated. In spite of the jealousy of his colleagues and Escalante’s maverick style, there’s one thing the guy did well, and that’s teach. He parlayed that success into the movie, the book Escalante: The Best Teacher In America, and a series of videos on math that are actually fun and informative (back when I watched them in high school). He dedicated his life to teaching, and the world’s a better place for it.